A Step by Step Tutorial on MotorVator programming. 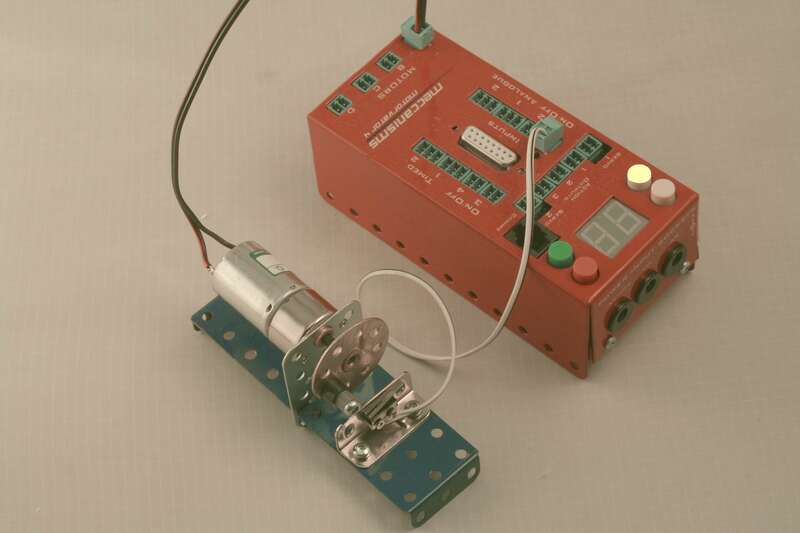 Using a simple test rig with a motor and a microswitch/cam arrangement, we will build up a program to measure and control the RPM of the motor. - 1 x Meccano #24 Bush wheel, with a bolt/spacers to press the microswitch once per revolution. However, you can build it any way you want, as long as the motor is controlled from MotorA output and a microswitch or contact is closed once per revolution. (note that the speed of the bush wheel can't exceed 100rpm, otherwise it will be going too fast to measure the RPM directly. If you are using a faster motor, you might need to include some stepdown gearing). Now we'll build up from a simple program, adding new concepts as we progress. Download each program by Right-Clicking and "Save Target As". We will start the motor turning, then count the number of revolutions (number of times the microswitch is closed), until we get to 100, when we will stop. Important to note that we have to only count once per revolution, so we can't just increment (add 1 to) the counter if the switch is closed, because it will be closed for 100s of instructions. So we make sure that we only count if the switch is now closed, but was open last time we checked! This would be a useful starting point for say a model LIFT, where you wanted to raise the car a certain distance using the number of revolutions of the winding drum to measure for each floor. We use the same code to start the motor and count the pulse. And we add on code to calculate the RPM and display it once we've counted 100 pulses. Rather than have to wait for the 100 pulses, we calculate an RPM based on the time taken for 1 revolution. Change the Initial_Speed byte value and see what effect it has on the RPM. Now that we can calculate the RPM, let's set a Target RPM and automatically adjust the motor speed until we are running at the RPM. Now let's allow the Target RPM to be adjusted up or down using the UP and DOWN buttons on the MotorVator. This requires us to implement some EVENT code. And finally, let's adjust towards the Target RPM more quickly, but changing the motor speed based on how far the current RPM is from the Target RPM. This is getting close to a standard feedback control system. Having complete these exercises, you might like to revisit the idea of the Model Lift. Let's imagine that your model lift requires 30 revolutions of the winding drum to go from the ground floor to floor 9. Could you change the program so that the lift started rising slowly, accelerated to a fast speed and then slowed down as it approached the 9th floor before stopping smoothly? Work out how quickly to accelerate.....for each pulse count, increase the speed by X until the maximum speed is reached. Decide when to start slowing down (how many floors below the 9th - 30 pulse - should you start decellerating?). You will want to be moving slowly just before the stopping point, to avoid a harsh stop and to avoid overrunning the position, but you don't want to be creeping up from the 7th floor. Now, how would you make this code more general, so that you could move from any floor to any other floor, yet still accellerate and decelerate elegantly?! Next, work out how to implement Floor Call buttons (connected to other inputs), so that Lift car can be called to and from any floor!